Ricot Duprevil, who was rescued Tuesday, says he was trapped in earthquake rubble for two weeks. Port-au-Prince, Haiti (CNN) -- As Ricot Duprevil tells it, rescuers saved him after he spent two weeks under earthquake rubble. 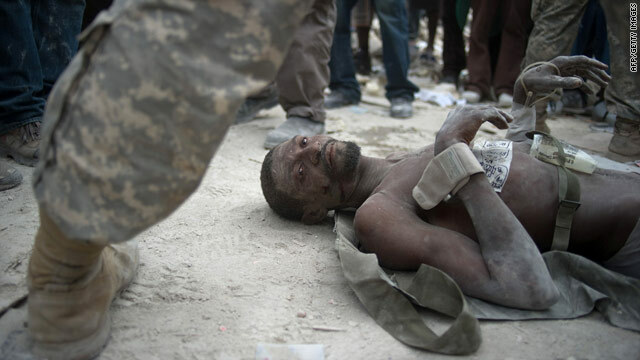 There's no question that Duprevil was pulled out alive from the rubble of a Port-au-Prince building Tuesday. But confirmation of his two-week account might just remain buried among the ruins. A doctor treating the 31-year-old man says he is inclined to believe Duprevil. The hospital where Duprevil was taken was unable to conduct an initial blood test that might have helped prove or disprove his account. And the U.S. soldiers who arrived and treated Duprevil after his rescue did not see which building area residents recovered him from -- a freshly collapsed one or one destroyed two weeks ago, when a 7.0-magnitude earthquake devastated Haiti. The residents who rescued him could not be immediately located. If the Haitian salesman did survive 14 days entombed in rubble, he would match a record set in 1990 by a man pulled free from the ruins of a hotel after a 7.8-magnitude earthquake in the Philippines. The Haitian government announced late last week that it was switching from rescue efforts to recovery operations, even as some survivors were found alive. On Saturday, a 24-year-old man was freed by a French rescue team, 11 days after the quake. That man, Wismond Jean-Pierre, had survived on soda found in the hotel shop where he was working at the time of the quake. And a 5-year-old boy named Monley flashed an ear-to-ear smile last Wednesday when he was rescued after eight days spent under the ruins of his collapsed home. Duprevil said he was selling soda when the quake hit and he ran inside a building in fear. The building then collapsed, he said. His family reported him missing after the quake, and feverishly looked for him. Meanwhile, Duprevil said, he survived by rationing water from a 2-gallon jug he found among debris. The water ran out Tuesday morning, he said. U.S. military medics and doctors at the International Medical Surgical Response team field hospital said Duprevil was severely dehydrated after being rescued, but otherwise had strong blood pressure and pulse. On Wednesday morning, he was in stable condition while being treated for a fracture to his right thigh bone. "Undoubtedly, this is very, very exciting, especially for all of us who have been deeply involved in this mission," said Dr. Henry Ford, who is treating Duprevil. "To pull this one out ... is exhilarating." CNN's Karl Penhaul and Kim Norgaard contributed to this report.